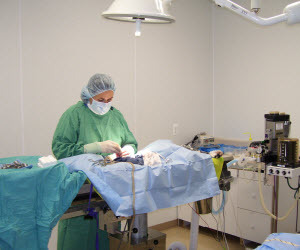 From simple laceration repairs to thoracic trauma, we are equipped to handle emergencies that require anesthesia and surgery. We carefully monitor our patients with pulse oximetry, doppler blood pressure, ECG and capnography under anesthesia. Our surgery suites are equipped with heated surgery tables, fluid warmer, specialized lighting and anesthetic ventilator.